Some members of the Telecom Fijiana 7s team in Sao Paulo yesterday. Photo: Chris Cracknell. The Telecom Fijiana team looks all ready to participate in the second leg of the Women’s Sevens Series in Sao Paulo, Brazil tomorrow. 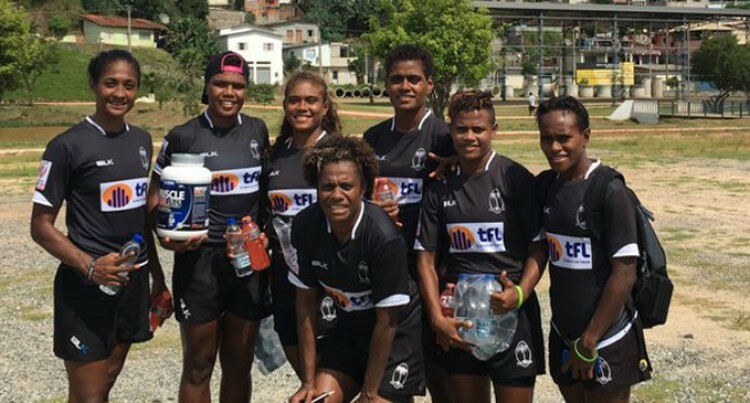 Fiji Rugby women’s coaching director Chris Cracknell said the players were excited and would do their best as they have the support of the whole country. “The girls can’t wait as they are proud of representing their country knowing they have the support back home.” Cracknell said. Fiji is in Pool A with Australia, Canada and Ireland. While the main aim in the long run would be on the Rio Olympics in Brazil in August, the Telecom Fijiana side will be focusing on finishing off better than they did in Dubai in December. Although they beat Canada and Ireland in Dubai, Australia will be a tough to beat after they beat New Zealand (15-12) in the Cup quarterfinals, France (26-0) in the semifinals and Russia (31-12) in the final. Fiji will be hoping to make a good start in the tournament. Fiji finished 7th in Dubai and Cracknell will be aiming to make it into the semifinals. Fijiana plays Australia at 1:44am on Sunday, Canada at 4:50am and Ireland at 7:34am on Sunday. World Rugby pick seven players set to weave their magic in Sao Paulo this weekend in the second round of the Women’s Sevens Series. Ellia Green (Australia) – An easy place to start, but how Australia must be grateful the former sprinter went to a Pathway to Gold identification camp purely because her cousin wanted to and ended up trying out herself. The rest is history and she gets even better with each tournament, her eight tries in Dubai – where she dotted down in every match en route to Australia claiming the title. The double act are reunited again after McAlister missed Dubai through injury. Woodman is a lethal finisher on her own – remember she crossed for 13 tries in Sao Paulo last year – but put the two former netballers together and they can rip defences to shreds seemingly at will. Ghislaine Landry (Canada) –The return of playmaker Ghislaine Landry is perfect timing, the ‘pocket rocket’ who scored 10 tries in Sao Paulo and went on to finish the 2014-15 series as the leading point scorer. With the ability and vision to create something out of nothing, Canada will need her experience from the outset with a tricky pool involving Australia, Fiji and Ireland. Marlie Packer (England) – A combative flanker and Women’s Rugby World Cup winner in 15s, this will be Packer’s first appearance of the 2015-16 series and England will want to see the 26-year-old at her rampaging best in Sao Paulo. Miriama Marawa (Fiji) – She may only be 18 years old but Marawa has impressed Fiji’s director of women’s coaching Chris Cracknell enough to be handed her series debut in Sao Paulo. A bronze medal winner at the Commonwealth Youth Games in Samoa last year, the half-back and playmaker will take time to settle but could she be the latest star to come out of the sevens mad country. BrazilChris CracknellFiji RugbyFijiNewsFijiSunRio OlympicsSao PauloTelecom FijianaWomen’s Sevens Series.